作者: Ashraf Dali on 7 May , 2012. 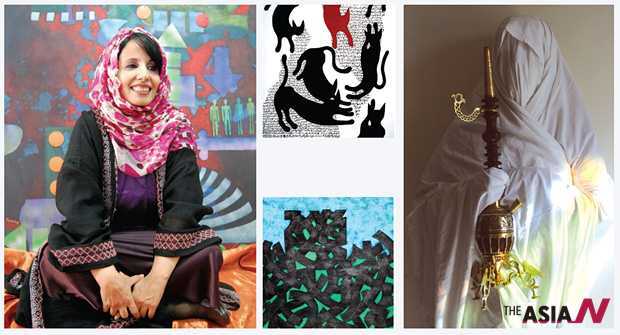 *Editor’s note: This is the first installment of six-part stories about six Arab women artists devoting themselves to creating different style of art and innovating their methods of expression for “revolutionary” change. What is revolution in art? Isn’t it calling for, seeking and attempting to bring about change? Look at the works of the six women artists I have selected and called “revolutionary.” Each of them wants to have a different style of art and innovate the methods of expression, even outside the traditional frame of painting, expressing herself and explaining her unease in works of art and writings drawn from national heritage or the results of her journey. Each revolution, therefore, becomes a landmark in the journey of art, which, one work and stage after another, always seeks completion. From the mantle of rejection of stereotypes goes up the cry for freedom, enlightenment and innovation. Here rises the role of art as not just a flimsy decoration for a life of fun and games, but rather an integral part of dialogue with society, deeply involved in its issues and concerns, without falling into the trap of shallowness or superficial rhetoric. Real art is not publicity material or party manifesto, nor is it just an action carried out under official or ideological orders, but, without exaggeration, it produces its discourse from within and reformulates society within its framework, so that societal action may later move out and mix with the crowds whom art provokes. The Arab artist is fully aware of the feeling of unease in her society’s men and women whom she lives and interacts with and, in turn, carries this unease to her own world, works of art and entire life. There is a large space in the Arab world where works of art are exhibited and evaluated, artists’ careers highlighted, festivals, gatherings and contests held, galleries opened and auctions conducted. At this particular time there are rising calls against art to undermine its role and underestimate it, and even question its raison d’être. The role of Arab women artists, therefore, is twofold and decisive: to champion art, as well as their femininity in Arab societies. It is women who share men in developing the values of political, economic and social change in their countries, particularly among the younger generations, and more specifically amid the Arab Sprig revolutions. All we have to do is to stress the role of women and not describe it, out of simplicity or disregard, with what underestimates it. I don’t claim to add anything new when I say that the history of Arab and international art is masculine par excellence. There are much fewer women than men artists in references on the history of art. That’s why the international revolution of women artists is part of the feminist movement, and the women artists’ movement which was linked to feminine art four decades ago was a call for changing the essence of art itself, from a masculine attitude and an exclusive men’s world in which all that women have is the model’s chair! As a matter of fact, this utopian call has waned soon after because an artist–a man or a woman like – expresses his or her human nature rather than gender. Accordingly, in post-feminist art today the only difference among artists lies in what is presented. To quote critic Lucy R. Lippard: “Feminine art has not been a style or movement but a value system, a revolutionary approach and a lifestyle”. Therefore, “content” rather than “form” represents revolution now, and we have to look at the icons of revolutions and signs of change in the works of the Arab women artists through comparison of the content. My choice of the artists here is neither encyclopaedic nor selective or on a merit basis, but is based on a close examination of their experiments and because they have something in common: women is a main theme in their works. My choices later may include new artists and cover the entire Arab world, as geography in the lines to follow are signs on the long road of art. This is the start of the journey, which, like a revolution, is an ongoing process. Amena Al-Nasiri Portrait and Paintings: Artist Amena Al-Nasiri (Yemen) in her atelier, with the dreams of birds which went out with mass migrants and came back home in search of the meaning of life. Here comes alive the role of Arab women artists, that is twofold and decisive: to champion art, as well as their femininity in Arab societies which still have a conservative attitude towards them which ignores their role in fostering the values of political, economic and societal change in their countries. I left the busy market in front of Sana’a Atelier (in the Yemeni capital), the old common studio of the Yemeni artist Amena Al-Nasiri together with her colleagues in the Contemporary Art Association: Talal Alnajjar, Rima Qassim and Mazhar Nizar, on my way to the wide road which leads to her “Universe” atelier (KAWN in Arabic). Not only does this new “universe” reflect her desire for independence but it also shows her commitment to change. She has set up the atelier, she said, to promote Yemeni art, stimulate interest in its issues, keep up with technical and theoretical international developments, develop visual taste, explore the areas of beauty in art, their diverse forms, content and aesthetic and technical values. Amena has lived a whole life of creativity, starting with writing and publishing a number of stories and devoting her life to art later. Her atelier is not open to her work and experiment alone but she has a central role, making it available for other artists to present their works and experiments and different arts, such as poetry reading. Her role as a university professor, holding a PhD in art on the artistic and aesthetic values of Islamic painting (Moscow, 2001), runs in parallel with her enlightening role which she fulfilled in a TV programme for two seasons on the Yemeni satellite channel in 1998, in addition to books containing selections of articles on art or drawings in literary books. “Academic work takes a lot of time and effort. I always feel in need of more time for painting, however, my contact with students gives me some satisfaction because I work in the same department of philosophy, (Faculty of Arts), where I started my university education and work with my teachers. In addition, philosophy and art are closely related, bridging the gap between creative and academic work,“ Amena said. Her cumulative visual and intellectual experiences are her main sources, an essential part of which are her memories, which she tries to enrich through new experiences and experiments. She always feels that painting is the perfect expression of herself and the transformations she undergoes. Likewise, it is her vision which she cannot express in writing very well, because the written text does not represent her as an artist and a human being. As I was taking photos of her among her modern works in the new atelier she talked about an experiment in painting she presented in an exhibition which stirred up a lot of controversy. As I recollected the scenes of the provocative paintings I saw that day I wonder if these works were displayed today we would say they express women’s movement in the new Yemeni revolution. But I visited Amena months before the protest movement in which women shared strongly, culminating in the awarding of the Nobel Peace Prize to Tawakol Kerman and two other women last year. Wasn’t that a wonderful, true expression that what artists predict is relevant to their involvement in their nations’ causes? Accordingly, art is not just a prophecy but also something which provokes revolution. In her photographic works women, under veils and siege, raised a cry of defiance and revolt which aroused the people and made Yemeni women wearing headscarves and veils stay in squares night and day. This is a clear message that hiding a woman’s face does not impair her ability to revolt, fight for her causes or express herself. Amena’s works always carry something new, but a central thread drawn from her past experience runs through all her works, a source of local visual icons and motifs which accompany her whenever she exhibits her works in Arab and world capitals: symbols of revolution which move in an uneasy world in search of its language through colour, ink or multimedia, the unease of a revolutionary Arab artist and dreamer. That’s a smart answer to a difficult qesution. Smack-dab what I was loiokng for-ty!